Chamblee’s Jade Foelske was named the Class 4A/5A Girls’ Swimmer of the Year by the GHSSCA this spring. the senior is a six-time individual state champion and a six-time DeKalb County champion. Two DeKalb County swimmers earned Georgia High School Swim Coaches Association Swimmers of the Year in their respective classifications after their performances this season. 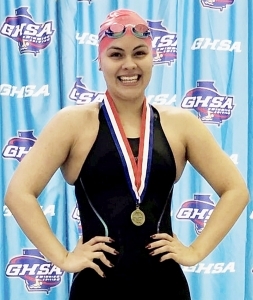 Chamblee senior Jade Foelske was selected as the Class 4A-5A Girls’ Swimmer of the Year by the GHSSCA after winning two individual gold medals and being part of the gold medal winning 200-yard medley relay team for the Class 4A-6A state champion Chamblee Lady Bulldogs. The team state title was the first ever for the Chamblee girls’ program and the first for DeKalb since Dunwoody won the 1987 state swim title. It ran Chamblee’s streak to top 10 state finishes to four (2016-2019) including eighth in 2018, second in 2017 and fifth in 2016. 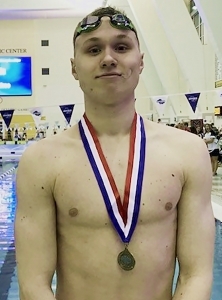 Foelske won the state gold in the 100-yard butterfly for the fourth consecutive year (2016-2019) with a time of 53.81 and the 200-yard individual medley in 2:00.22 for the second consecutive year to become a six-time individual state champion. She became the first DeKalb swimmer to win two state championship gold medals in one meet in back-to-back seasons since Peachtree’s Callie Emery won the 50-yard freestyle and 100-yard freestyle in three consecutive seasons from 1979-1981. She was also the first Chamblee swimmer to accomplish the feat since Heidi Jachthuber accomplished the feat in three consecutive seasons from 1974-76. Foelske’s sixth state gold medal ties her with Jachthuber in the all-girls’ state gold medal winners list for DeKalb County and finishes her career just one medal off the seven set by Nancy Chapman of Briarcliff (1961-64), Lori Pettit of Henderson (1968-72), Callie Emery of Peachtree (1978081) and Julie Ginden of Peachtree (1977-80). She teamed with Kayla Maloney, Teresa Maloney and Sophie Bell to win the Class 4A/5A 200-yard medley relay with a time of 1:45.99. It was DeKalb’s first state title in the event since 2017 when Chamblee took the title on a team with Foelske, Teresa Maloney, Julia von Biberstein and Brynn Lautenbacher. Before that 2017 win it had been 37 years since a DeKalb entry had won the 200-yard medley relay. Foelske wrapped up her career with six individual gold medals and two as part of the 200 medley relay teams in 2017 and 2019. The talented swimmer also became a six-time county champion this year with wins in the 200 individual medley (2:07.08) and 100 butterfly (57.11). Her win in the 200 individual medley set a new DeKalb County Championships record breaking the one set by Lakeside’s Katie Suhr (2:09.57) set in 2006. She also owns the 100 butterfly record of 56.58 set in 2018. Dunwoody’s Grant Allison was named the Class 6A Boys’ Swimmer of the Year by the GHSSCA this spring. The junior won the 100-yard freestyle at the Class 6A state meet and was runner-up in the 50 freestyle. His a six-time (3 50 freestyle, 3 100 freestyle) DeKalb County Champion. Her county titles include the 500-yard freestyle (2018), 100-yard freestyle (2017), the 100-yard butterfly (2016, 2018-19) and the 200-yard individual medley (2019). She has also been part of four county championship relay teams. She teamed with Kyla Maloney, Teresa Maloney and Sophie Bell to win the 200 medley relay this year and her third of being part of the winning team. Foelske added the 400-yard relay (3:46.14) to her resume this year teaming with the two Maloney’s and Anna Blankenship. Dunwoody junior swimmer Grant Allison was named the Class 6A boys’ swimmer of the year by the GHSSCA after leading the Wildcats to a fifth place finish in the Class 6A State Meet this year. Allison won the 100-freestyle state gold medal (45.29) and became the first Dunwoody boys’ swimmer to win a state title since Justin Wingo in the 2000 100-yard breaststroke. It was also the first boys’ individual state title for DeKalb County since the 2016 season when Chamblee’s John Mitchell won both the 50-yard and 100-yard freestyle races. He came very close to winning the 50 freestyle finishing as the runner-up with a time of 20.81 to help lead Dunwoody to fifth place finish in the Class 6A state standings. It was the third consecutive season for Dunwoody to finish in the Top 10 including 2018 (5th) and 2017 (9th). The junior already has six DeKalb County titles under his belt after winning both the 50 freestyle (21.75) and the 100 freestyle (47.37) for the third consecutive season. He also teamed with Parker Bragg, Nicholas Bragg and Miles Gumbrill to win the county gold in the 400-yard freestyle relay (3:19.06) this year.